(Gingerland, Nevis) – Pastor Jerry Languedoc of the Seventh-day Adventist Church in Gingerland has been keeping busy since arriving on Nevis in June. Rotating through four congregations on the island, the pastor hopes to bring a higher level of spirituality to Nevis. The pastor and his wife are very pleased with their new surroundings. “Nevis is very quiet and the people are vey caring. My wife and I enjoy it very much,” he said. The pastor grew up in Dominica and did his internship in St. Thomas. He met his wife, Juliet, in her home country of Trinidad while attending Caribbean Union College, now known as the University of the Southern Caribbean, in 1990. Seventh Day Adventist pastors rotate to different churches every four to five years. 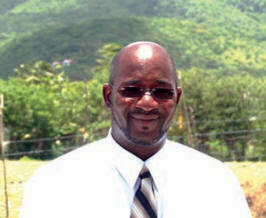 Pastor Languedoc has led congregations in St. Croix, Tortola and Virgin Gorda. The pastor rotates between Gingerland, Brown Hill and two congregations in Charlestown, one of which is a Spanish group. Elders in the church rotate to fill in when he is at another congregation. On Saturday they have Sabbath School at 9:15 a.m., Divine Service at 11 a.m. and a youth service at 5 p.m. An Evangelical service is held at 7:15 p.m. Sunday and Wednesday at 7:15 p.m. is the midweek prayer session.